Beyond TAST is an embroidery challenge at Pintangle. I was thinking what to do without starting a new project. 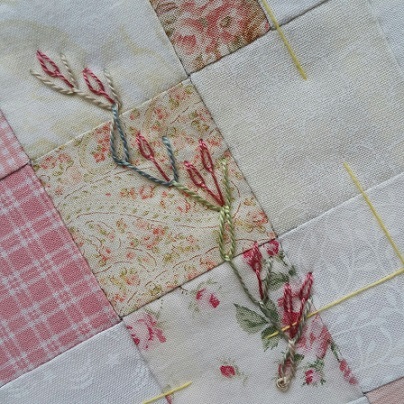 Then I thought about a quilt top I made 8 years ago with the plan to add embroidery. I wrote about it here. Then it was time to add the first stitches. I started with feather and chain stitch in perle 5 and long tailed detached chain stitch in cotton a broder. 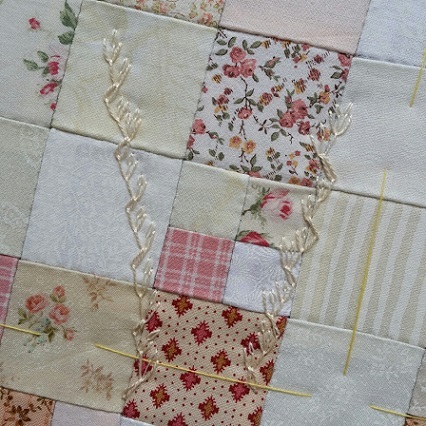 The yellow threads are the tacking stitches, which will be removed when all embroidery is done. But the colours where too strong for my quilt, so I frogged them and made new feather and chain stitches in perle 8 and long tailed detached chain stitches in cotton a broder. Nice annet. I like the embroidery with color threads. I liked the colour embroidery, too, Annet. I think the quilt can take it. Thanks Barbara. In close up the coloured version looked right, but on the quilt it took away the softness of the quilt. I waited a few days to frog it to be sure!